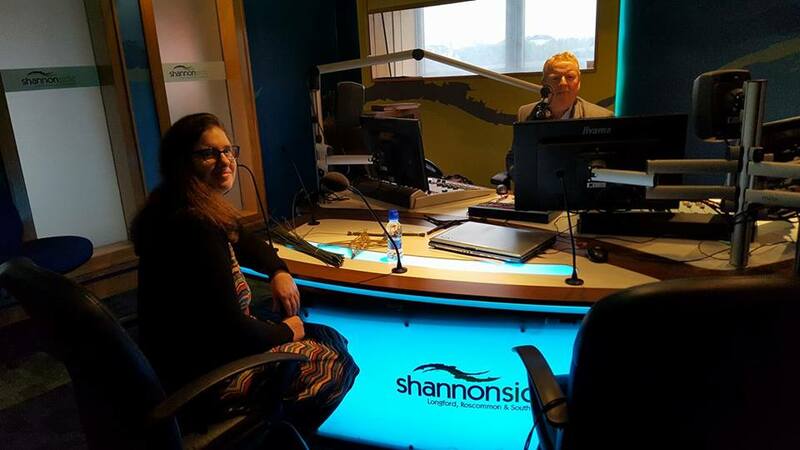 Annette talking about St. Brigid on the Joe Finnegan Show on Shannonside radio. We had a lovely St. Brigid's Day! Annette got to talk to Joe Finnegan on Shannonside about St. Brigid and making crosses and Ann joined the locals on the Annual Walk to the Well. Thank you to Martin O'Connor for having tea ready for all of us when we got back to Ardagh Heritage and Creativity Centre and everyone who joined us. Ooh and I nearly forgot, Ann got a little article in the Leader too (read it below or here) ! Let's do this,and the workshop of course, again next year!!! Here we are at another 1st February, St. Brigid’s Day, the festival of Imbolc, the beginning of Spring. It sprung into my mind that while St. Brigid is famously connected to Kildare, that we should explore her links with Longford as she continue to be acknowledged locally by all the churches, schools and clubs that are named after the Patroness of Ireland and by the traditions that are alive in the area. The St. Brigid everyone knows about is the St. Brigid we learned about at school, a slave by birth, born circa 453, in Faughart. Her mother was a Christian woman, Brocessa, slave to a chieftain Dubthach. She was kind and generous and has many miracles to her name, the most famous being that of the original St. Brigid’s Cross and the one about her cloak covering enough area to claim as a convent in Kildare. Long before Christianity there was another Brigit. In Irish Mythology, Brigit was the daughter of the Dagda and one of the Tuatha De Danann, wife of Bres of the Fomorians. She is often seen as a threefold goddess over healing, poetry and smithcraft. (Lebor Gabála Érenn). Many of the stories of the mythological Brigit and the Christian St. Brigid have similarities, the Brigit’s doll became the St. Brigid’s Cross, the Brigit’s mantle became St. Brigid’s Cloak and many of the miracles performed by St. Brigid mirror the powers of the ancient goddess. What are St. Brigid’s connections to Longford? The first connection of Brigit to Longford, and not a widely known connection, is Brigit was daughter of the Dagda and so therefore must have been half sister to Midir, son of the Dagda, Midir of the local legend of The wooing of Étáin, Midir of Brí Leith, Ardagh and The Bog Road in Corlea, Kenagh. There must be many stories to be uncovered about this half sister and half brother and hopefully by this time next year we will know more. It is interesting, given our history of poets and writers in Longford, that Brigit is the goddess of the poet. St. Brigid has strong connections to the county too. By many accounts she came to Ardagh and received the veil at the hands of St. Mel. In some writings she is said to have been professed as a nun, in others she was professed as a nun and also received abbatial powers and in others, my favourite, she was ‘accidentally’ ordained a Bishop by St. Mel. While it is widely accepted that St. Brigid established her first convent in Kildare there are a number of writings that say otherwise and that her first convent was in Ardagh, Clonbroney or Ballinalee. The Duchas schools' collection have many stories about St. Brigid in Longford. One story (click here) in the Duchas collection talks of her first convent being on the north side of Sliabh Galry, another name for Ardagh Hill and another says that St. Brigid carried coals two miles and her Holy Well in Ardagh sprung up where she dropped them. Another states carrying the hot coals was a penance given to a local woman for disrespecting St. Brigid. However tentative or true the connections to Longford are we do know that there is a St. Brigid’s Well in Ardagh that is visited every 1st February by the locals, that there are many schools, churches and clubs called after St. Brigid throughout the county and that the tradition of making the St. Brigid’s Day Cross continues locally.